Here the story is seen and told of the famous World War II Marine Raiders, the first and most famous commando-type outfit ever formed by the U.S. Marine Corps. The Raiders provided fast, hard-hitting assault units designed to inflict surprise strikes. They are the only U.S. military unit in American history authorized to use the Death's-Head Skull as their official symbol. Visitors will see why. 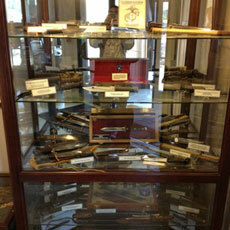 Large glass display cases, and a dozen display boards tell the gallant Raider story. You'll see on exhibit the first Japanese flag captured during the war (Lt. Col. Evans F. Carlson's Raiders brought it back from the famous Makin Island Raid of 1942). 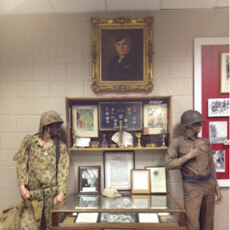 The Museum features numerous photos of the Raiders in training, in camp and in combat. 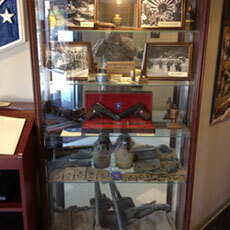 Also displayed are firearms, tools, equipment, uniforms (Raiders were the first to wear camouflage uniforms in World War II) and many fascinating implements of war. 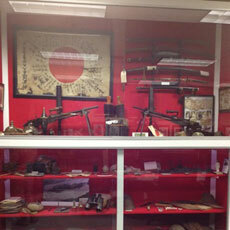 Visitors will also see captured Japanese combat gear. The evolution, training and combat success of this special unit, depicted here, chronicles the Raider story and inspires all who see it. * (Going N) Traveling from Richmond, Va., north towards Washington, D.C., on Interstate 95, get off the Interstate at Exit 148. At the bottom of the hill, turn left. Go 1.5 miles to the Sentry Booth. * (Going S) Traveling from the Washington, D.C. area south on Interstate 95, take Exit 148. At the bottom of the hill turn right. Go 1.3 miles to the Sentry Booth. * At the Sentry Booth, you will need to show your driver's license and tell them where you are going. 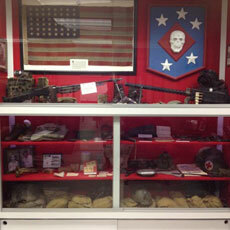 Your destination is Raider Hall or MACE (the Martial Arts Center of Excellence) to visit the U. S. Marine Raider Museum. 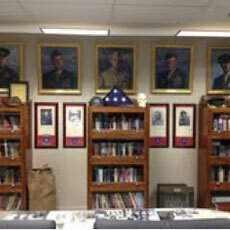 The Sentry may not be aware of these specific locations, but tell him they are by TBS (The Basic School). 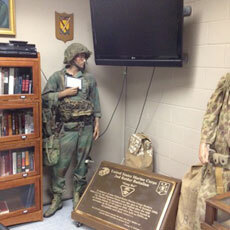 * From the Sentry booth, keep straight for 1.6 miles to the intersection at the Fire Department. (There is a water tower on the right at this intersection.) Turn left at the Fire Department and keep straight for 2.8 miles. At the stop sign, turn left. Go .2 mile to the next stop sign. Keep straight and drive up onto the parade deck/parking lot. At the top of the hill, Raider Hall will be located to your extreme left, at the end of the parking area. * There are several reserved spots at the end of the area reserved for visitors going to the Martial Arts Training Center (Raider Hall); you may use these, if you like. * A word of caution: when you visit the base, obey the speed limit and directional signs. When they say 35 MPH, they mean 35 MPH! 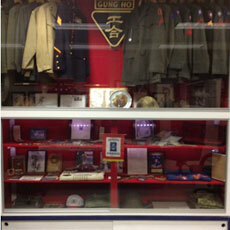 Museum Hours: 7:30 a.m. - 4:30 p.m.